Now supports both and protocols! The main components of the Whirlwind E Snake system consist of E Snake Frames (ESF), E Snake 2 units (ES2) and E Snake Control software for managing the system. Two or more of these units connected to each other through a 100Mb Ethernet switch with CAT-5 or fiber optics replace the traditional analog multipair audio snake. E Snake utilizes CobraNet® or EtherSound®, the industry standards for real-time, multi-channel networked audio. Each master unit (ESF or ES2) consists of a hardware frame and motherboard that can be configured with input cards and output cards. Each card is capable of processing eight channels of audio. An ESF can accept up to 4 input and output cards. Therefore, each ESF is capable of simultaneously processing 32 inputs and 32 outputs. ES2 can accept any two I/O cards and therefore process up to 16 inputs or 16 outputs or 8 of each. Multiple frames can be used with Gigabit switches to increase the capacity to literally HUNDREDS of channels if required. 300 ft. of 58-channel multipair cable with multipin connectors weighs approximately 175 lbs. The Whirlwind E Snake can span 328 ft. (100 Meters) with a single CAT-5 cable weighing about 7 lbs.! Greater distances can be achieved economically by inserting an additional Ethernet switch functioning as a repeater or converting to fiber optic cable. At left is Whirlwind's WD-1 reel loaded with 500' of heavy-duty fiber optic cable. SC type connectors are integrated into the reel flange and the opposite end is Whirlwind's TFOL (Tactical Fiber Optic Link) connector designed for use in demanding applications. Set up and tear down are faster, you'll carry fewer road cases and haul less weight in the truck. 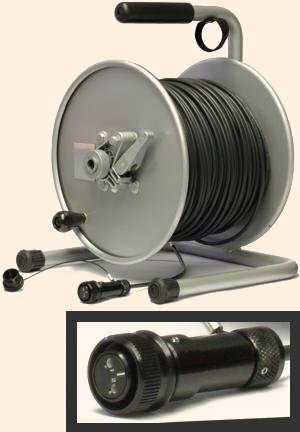 Employing lightweight network cable also opens up added possibilities for routing the cable overhead, around obstacles or underground. And replacing damaged cable is a LOT less expensive than replacing or repairing 58 pair cable and multipin connectors. Unlike analog snakes, E Snake is virtually impervious to the effects of induced interference and is not subject to ground loop problems. 48kHz sampling rate @ 20 or 24 bit word length coupled with the finest components and designs provide full frequency response and wide dynamic range. Start out with a basic system with as few as 8 channels. Then expand by adding input and output cards for up to a total of 32 channels in each direction. Then add more ESF or ES2 units to expand the channel count further or to split the audio between multiple locations. Each E Snake unit can be configured with input cards that are available in several versions - mic/line, transformer mic only with Lundahl transformers, and AES/EBU digital. Cards feature high-end preamps designed to provide wide frequency response and superior S/N ratios. 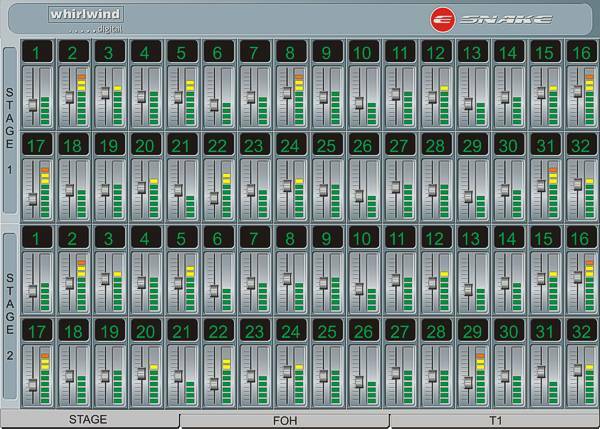 The Whirlwind E Snake Control software (included) provides control of input features such as mic/line switching, 48V phantom power, pad, limiter, gain control, channel labeling and metering. E Snake Control "Channel Detail View" for Mic/Line Input card shows 8 individual E Snake channels. Additionally, each E Snake unit can be configured with output cards which convert the digital information back to analog at the same level that was input at the transmitting module. This makes the E Snake a "virtual wire" - as gain is adjusted with E Snake Control to optimize the performance of the A/D converters at the input end, the analog level of the output card is adjusted by the same amount but in the opposite direction. Therefore, once you have set your analog console's gain structure, adjustments to the E Snake's gain stage won't affect the input level at the board. Optional output cards are available as Mic/Line and AES/EBU. Output card types are independent of the input type at the other end. Input mic signal at the stage and output line at the console - or input line level at one end and output AES/EBU at the broadcast truck. E Snake supports any combination of input and output cards. 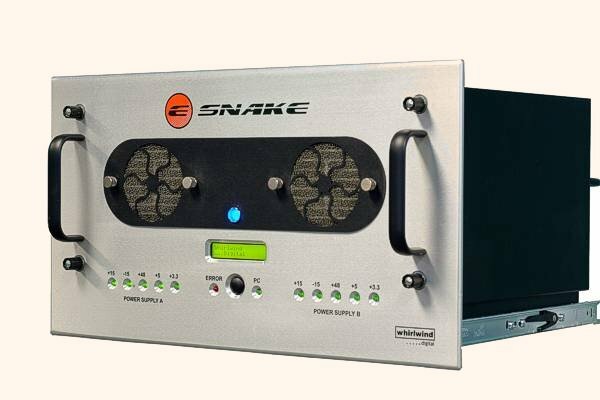 E Snake Control monitors adjustments and stores all of the settings and parameters of your performance to a pair of backup files on your hard drive once each minute. In the event of a communications failure or accidental computer disconnect, E Snake will continue to perform without interruption and with the same settings. Then, the previous state will be loaded into the PC from the backed-up settings when the computer comes back online. There's even a redundant back-up feature that duplicates all parameters to a second removable medium such as a 3.5� floppy, zip drive, USB drive, etc. so that settings can be transferred to a backup PC. We've designed the E Snake to be completely functional without unnecessary complication. Its design is so intuitive that you'll be up and running within minutes of installing the software on your PC and connecting it to the E Snake network. However, advanced users will find a robust set of features �under the hood� like user definable channel array pages, color-coded channel text, automatic detection of ES units through unique architecture definitions and full compatibility with other CobraNet or EtherSound devices. User defined overviews of multiple channel arrays let you group channels the way you want to see them. 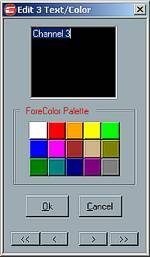 Channel text and color editor provides for custom labels and color-coded text. All settings can be saved to preset files for quick recall. Just open a preset file and E Snake Control loads and verifies all of the system architecture, individual channel settings, channel labels and channel array definitions. It's great for repeating stage setups where inputs can be pre-configured and recalled instantly. Startup screen with file chooser - select most recently used presets or browse for more files. A separate Architecture Editor application is also included with the E SNAKE Control software package that allows the user to configure systems of multiple ES units, specify what types of I/O cards are loaded into each frame and setup CobraNet bundle assignments and channel mapping. Invaluable if a provider had multiple ES units and I/O card types in stock and needed to configure systems with varying capabilities depending on the application. This could be especially useful where certain mic channels are not meant for FOH but need to be routed to a recording truck. Or if an ES unit is to be introduced into an existing CobraNet installation, bundle assignments can be customized to produce the expected results. 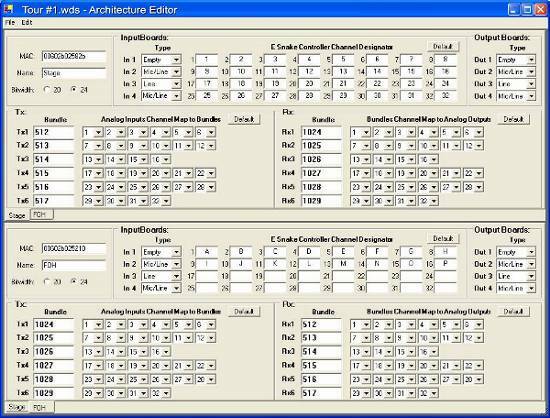 Screenshot of Architecture Editor application. 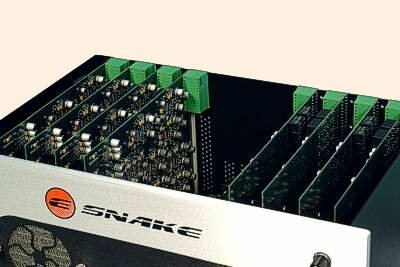 Since this system is based on CobraNet or EtherSound, the industry standards for real-time networked audio, you can interface the E Snake with any other compatible products. Use a single E Snake unit configured with input cards as an input module to get multiple channels of mic or line level audio into an existing system or split the digital signal to multiple nodes with a standard Ethernet switch. This makes E Snake an ideal front end for connecting to digital mixing consoles that offer direct digital input interface modules such as Yamaha's PM5D, DM2000, O1V, etc. Whirlwind has been recognized as the leader in audio snakes, cables and splitters for over 25 years. Every bit of that knowledge and experience has gone into researching and developing the E Snake.